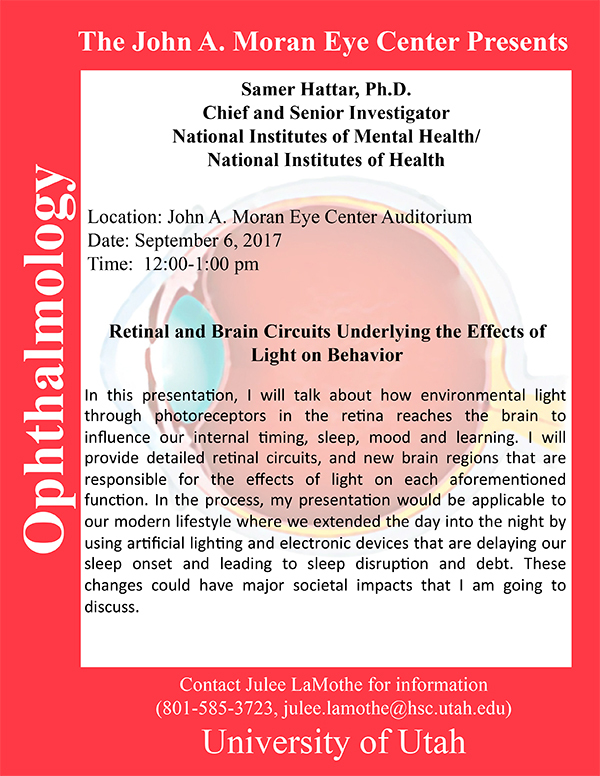 Samer Hattar, Chief and Senior Investigator at the National Institutes of Mental Health/National Institutes of Health will be delivering a seminar on “Retinal and Brain Circuits Underlying the Effects of Light on Behavior” on Wednesday, September 6th at 12:00 Noon in the Moran Eye Center auditorium. 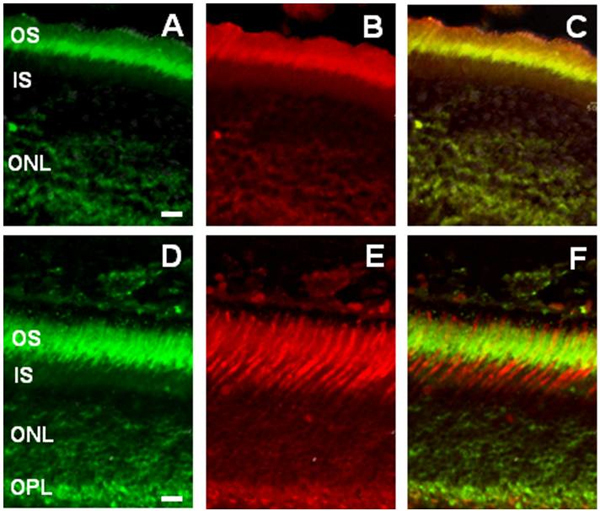 Abstract: In this presentation, I will talk about how environmental light through photoreceptors in the retina reaches the brain to influence our internal ,timing, sleep, mood and learning. I will provide detailed retinal circuits, and new brain regions that are responsible for the effects of light on each aforementioned function. In the process, my presentation would be applicable to our modern lifestyle where we extended the day into the night by using artificial lighting and electronic devices that are delaying our sleep onset and leading to sleep disruption and debt. These changes could have major societal impacts that I am going to discuss. 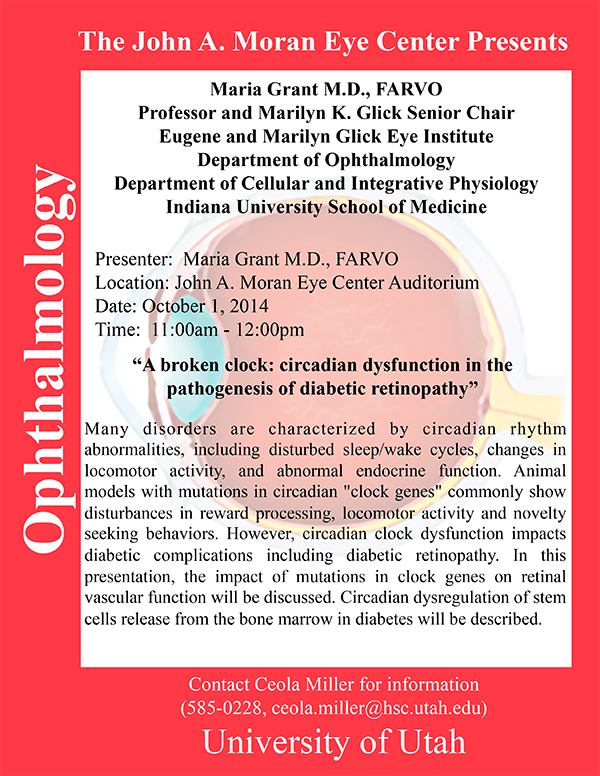 Maria Grant, Professor and Marilyn K. Glick Senior Chair, from the Eugene and Marilyn Glick Eye Institute, Department of Ophthalmology and Department of Cellular and Integrative Physiology, Indiana University School of Medicine will be delivering a seminar in the Moran Eye Center auditorium on “A Broken Clock: Circadian Dysfunction In The Pathogenesis Of Diabetic Retinopathy” on Wednesday, October 1st at 11:00am. Many disorders are characterized by circadian rhythm abnormalities, including disturbed sleep/wake cycles, changes in locomotor activity, and abnormal endocrine function. Animal models with mutations in circadian “clock genes” commonly show disturbances in reward processing, locomotor activity and novelty seeking behaviors. However, circadian clock dysfunction impacts diabetic complications including diabetic retinopathy. In this presentation, the impact of mutations in clock genes on retinal vascular function will be discussed. Circadian dysregulation of stem cells release from the bone marrow in diabetes will be described.